High quality aluminium door range in a minimalist design. The doors offer the highest degree of thermal insulation and energy efficiency through coated, gas-filled quadruple glazing. They have a thermally broken aluminium system with a three chamber frame profile, fibre glass reinforced 35 mm polyamide rails, foamed insulating core and aluminium profiles on the inside. 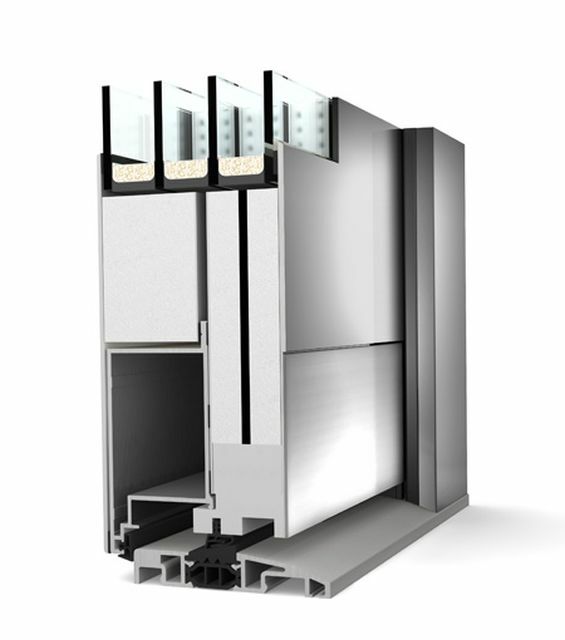 The special two-part door panel provides good heat insulation and the aluminium cover layer as well as two layers in-between ensure high stability. The doors are inward opening and have a smooth door leaf on both sides. Thermal insulation: Up to 0.75 W/m²K. Sound protection: Up to 36 dB. Special triple gasket construction with overlapping, high-quality elastic silicone gaskets. Three dimensionally adjustable turn hinges. Different styles are available to suit different applications with various viewing panel options; consult manufacturer's literature for more information. A wide range of powder-coated or anodized surface options are available. Consult manufacturer's literature for more information. The product information below is from the NBS Plus library of product clauses offered in NBS specification products. It has been created by NBS for Internorm Windows UK Ltd. Each product clause is authored in NBS format and is intended for inclusion in project specifications. Please note that NBS product guidance is not a replacement for the manufacturer's literature and it is recommended that Internorm Windows UK Ltd be consulted before specifying. Five point - Two locking claws, two security bolts and one main locking bar.